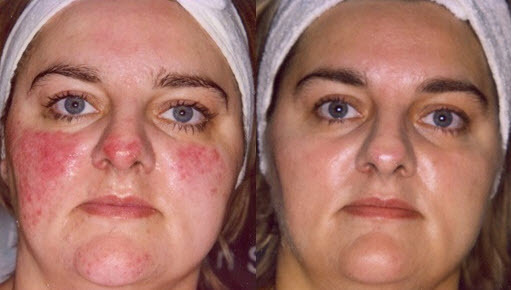 Rosacea treatment at Van Lennep Kliniek The Hague and Oegstgeest. Rosacea is a skin problem that affects women in particular, but men as well. Rosacea is a combination of vascular abnormalities with acne and is caused by bacteria, sun damage and unhealthy living habits. Rosacea is characterized by redness of the nose and/or cheeks with small inflammations. The condition usually occurs in people over 30 years old. The laser can treat the excess vessels very successfully, without damaging the surrounding tissues and skin. After 2 treatments, a major improvement will be visible. Usually 3 treatments will be necessary, though. It’s important to use proper sun protection during the period that you are being treated and not to go to a tanning bed or sauna. In addition to laser therapy, good skin care is also important for reducing sun damage in the form of vascular abnormalities. Rozatrol is the revolutionary serum against rosacea, designed by the world-famous dermatologist and skin care expert Dr. Zein Obagi. Rozatrol from ZO Medical contains an advanced amino acid complex and helps skin to restore and intensify cell renewal. In addition, a mild exfoliation improves the skin texture. Antioxidants protect the skin and inhibit inflammation. The innovative serum ensures a calm, even, healthy skin. Order Rozatrol online at Van Lennep! The red skin can be camouflaged very well with the mineral make-up from Jane Iredale. Our beautician will be happy to show you which products best suit your skin colour and how to apply them. Do you want to know if your skin will respond well to the rosacea treatment? Please stop by our clinic. Cosmetic doctor Ludy Holst is happy to answer your questions. Please feel free to make an appointment without obligation.